front 2.5", nape 1.5". hope this helps. On the Ellen Wille website though, it shows 1.5" for the bang. Looks like a typo somewhere. It is hard to find the "right one". Don't lose heart, you will find it. 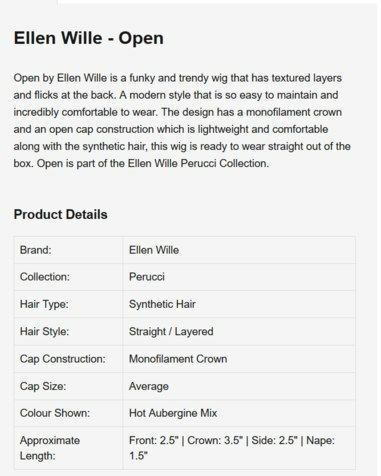 If there is a specific colour you love, there is a search you can do on the Ellen Wille site, and it will bring up all of her wigs available in that colour. I did a test on cinnamon mix for this one. .
Gee Misty you are a hive of information and I will go search out the EW seach button for the colours i like that will be great... Yes I am on 3 acres which is very rare on the North shore of Sydney.,... we are one of only 8 property's her where I Live that have between 3-6 acres .. but 3 acres is plenty ....lol and yes we have all sorts of wild live that comes up onto our land from the National Park, we have Kangaroo's that poo up here , silly things as they have plenty of other grass to do it on besides our back yard...lol, and Just for the last week we have had the pleasure of seeing a mother Duck and I think Daddy duck with which started out with 15 baby ducklings visiting our back yard every morning , sad to say they are now down to 10 babies..as of this morning.... plus the Kookaburra's and magpies and the Cockatoos and pretty colourful parrakeets. The only bad thing is that we are in a very bad paralysis tick area so not good for my dogs. Your 10 Acres sounds like a lot of work ...especially since you still have a job from what I have read.. If you go to her website, then click on the search icon located top left hand corner of the home page. Type in the name of the colour you like and enter, and then all the wigs that have that colour will load underneath. Your place sounds beautiful! How do the kangaroos and your beautiful puppies get on together? I hope okay. We usually have some ducks as well, however our lagoon has almost dried up with the drought. I just love our Aussie wildlife. Sad to hear you are in a bad paralysis tick area, we are as well. It was horrendous keeping them off our OES. We still have our clydesdale, and even he has reacted when he has had a tick near the vein on his neck, very sad. Yes, we have our own business, and around 14 employees as well, so definitely keeps me hopping at times! Our10 acres is fairly open, we just have the 4 acre horse paddock fenced off, and then the main fence around the whole of the property. When we bought the land, we planted a huge amount of trees and shrubs and created a rainforest envoronment, with a couple of areas outside of the horse paddock as open grassed areas. Our OES would be wherever we would be, either playing outside with us, or inside etc. We have deer come through the property which sounds cute, however they cause all sorts of damage. Our clydie doesn't mind them, he thinks they are "relations come to visit" LOL. I've noticed the wrong measurements on several of EWs wig descriptions. I've ordered and returned 2 Open wigs and can promise you the bangs are closer to 3.5 inches than 1.5. You can see that in the video I linked you to in the other thread where Deb reviewed this wig. I'm so sorry, I really should have put her link above again. It was 4:00am here when I posted and I was headed to bed and guess I thought it would be redundant for me to post the same video again. She does several EW wig reviews and I thought you'd enjoy her reviews. You really should check out some more of her videos. No, I did not keep the Open wigs. I absolutely loved this wig on Deb but, like most short wigs that I loved on her or other reviewers, Open was just too short on the sides for me. I had the same thing happen with Date and Sky. So cute on other people, but the sides are just too short for my face and they just don't look right on me. Now I pay close attention to the posted measurements of any style I'm interested in. What wigs have you worn and loved or is this a first wig that you are looking for? Hi Vee, Well I am not surprised that you missed out on sending a link if it was 4 am in the mornng, that is something I do a lot as I go to bed late ( 1.30pm) and then sleep for a few hours and then either come out to the computer or just persevere and try to go back to sleep until 6 am when then I am up again.... Thanks for the information on the reviewer ( DEB) as I sat up late last night just looking at hers and she does have lots of short reviews.... I sometimes looked at the reviews done by the lady called Heather I think she is from Cys wigs but I then got turned off the wig as they sat so different on her head as she does have such a round face and they seemed to sit much shorter on her.. so I am slowly learning to try to look at others as well.... what is the lady's name who also seems to do the reviews for Ellen Wille herself... I will have to find a link and send to you to look at as I have never seen her name anywhere.. I have only been trying them on here at home and have not gone out in public at all as yet , I feel that the Liza from EW is too small on my head and feel like it wants to pop off , the other two fit ok ... It seems that I would like to put something from each one together on one to make one that I really like, example the Nap on the Liza petite is only 1.5 and I don't like the top so much on it , it also has a longer fringe and I don;t care much for the colour ( Chocolate mix ) but I just need to give it a trim when I get up the nerve to do so...,,, The Fringe on the Sheila petite is just perfect a good length for me , but the Winner is a bit short ... but the colour is good on both of these two in Dark Brown.. I now have the EW Start and the EW Ever Mono on order , so I will wait to see what these two look like although I am a bit worried that both may have too much hair for my head, but can only wait and see when they arrive, I have ordered The EW Start from PP , and the other from a Retailer here in Sydney. I am trying to remember the name of that wig model, but not having any success. I think #Moonlitnight probably knows. We seriously do have to be careful when watching wig reviews. I've often wished that every reviewer would list her head measurements on her YouTube site. It took me a long time to realize that short wigs would never look the same on me as they do on Deb. This is simply because of head measurements. I can tell better what length a short wig will be on me by looking at Heather's videos. Her face shape in most of her videos is much rounder than mine but her head measurements must be closer to mine than some of the reviewers. Also, Shannon from Canada wigs must have similar measurements to mine. After a while you figure out whose videos to watch. Now, like I said before, I pay more attention to the posted measurements of whatever wig I'm looking at. The side measurement which is usually most important to me begins right about the tab and, since the tab usually hits a little higher on me then on women with a smaller ear-to-ear measurement, I need a little longer-length there. Godiva's wigs are all actually wigs made by a different brand with the original brands tag replaced with Godiva tags. I'm not sure which wig Sheila is, but a lot of the Godiva wigs are Noriko brand or Rene of Paris and can usually be bought cheaper from them than from Godiva. I am so hoping you find a style you love soon. It can get so expensive trying to find the right one. And 2 days is definitely not long enough to decide if you want to keep one or not! Maybe you can sell some of your mistakes on Ebay or on The Wig Hub. Several of us here do that. Even if you don't recoup all of your money you also don't lose all of it! We are going to find you a wig!! Shannon from Canada I will have to do a search for as again I have not heard of this lady ... It is so very hard seeing all the different ladies doing the same wig review as they can all look so totally different., but it certainly gives you a better idea at least.. I do like watching PP reviews as she is such a character and she seems so full of life..
it's called White Label sellers. They just have other companies Supply the wigs to them with their label sewn in. I know that they're Sabrina is actually a Rene of Paris Tori. Also their Freedom is Sky by Noriko. And I know that you can get these cheaper on normal wigs sites than you can buying them from Godiva. Oh, I'm pretty sure the wig model you were talking about is Roxy. 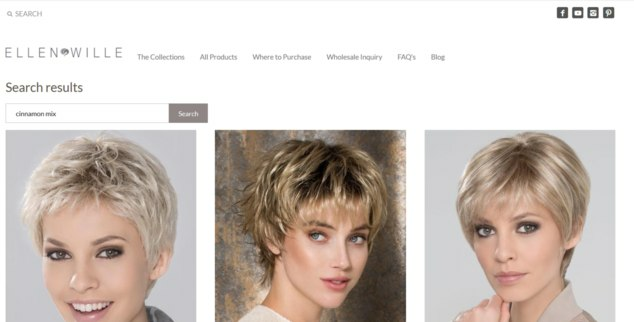 Shannon from Canada does reviews for Canada Wigs dot com (which overprices wigs imo) and also sells iWigs (really high end HH wigs). Her Facebook page is The iWig Boutique. Yes, Godiva's just has wigs private labelled under Noriko brands' white label program. Then they make like their wigs are unique and charge more. Well looks like I will slowly learn all the cons and pros....lol I wonder what make my Sheila petite from the Godiv ... really was... it is not half bad at all.. I will check out the Canada wigs just for the reviews.. It will be either Rene of Paris, Noriko or Amore. I am guessing ROP. the circumference of my head is just a smidge over 22"....from the top of one ear to top of other ear is 12"....hairline to chin is 8" ...crown to nape is 12". I also just finished watching a review of Kendal with Nisha, oh you ladies who can wear longer wigs and blonde as well are just so lucky.... it is a pretty wig. I measured from top of my ear lobe to other ear lobe. BTW....I can't see the video you tried to link to above. Oh and in my measurements I forgot to add that my crown to nap is 7 ".. I don't do long wigs and I don't do blonde. I have thought of trying Kendall though!! So what wig are you wearing in your profile picture... it looks good on you.. and is that close to your natural colour ? the side measurement of a wig is taken from the side tabs. So, if the side is 3" it falls 3" from that tab. The tabs always hit me at about the top of my earlobe or a bit above. On some people the tab comes lower down so the sides would be longer. Thanks! The wig in my profile picture is Kona by Belletress. It is my first wig that isn't really short and I really want to try others. Nothing past my shoulders though! The color is Mocha with Cream and is very close to my natural color. When I first started wearing wigs my own hair was blonde with dark roots so, I did wear a lot of lighter colors then. I really do prefer Auburn and light browns though. nooooooo.....not 71!! I will be 66 in October. Paprika is definitely going to be a very red auburn!! I think it looks pretty much the same in videos and swatch. Check out Heather's video of the color. Really enjoyed reading through this post.....I love animals and wildlife and love reading about them. My husband and I both want to go to Australia someday, God willing. We have almost 4 acres and have tons of wildlife come through, bears, deer, moose, skunks, etc.....tons of birds we feed, squirrels and chipmunks, love watching them while we have our morning coffee. Our dog thinks that the smaller mammals are to chase up trees but knows enough to stay away from the bigger ones..........of course, if we know there is a dangerous one around she does not go out!! Just saw a bobcat and that one scares me with the dog so we go out with her. Anyways, I was looking at Open and am so glad I read through this. Vee1028...thanks for mentioning that the sides were too short, made me go back and look and you were right. I was mostly looking at the back. It reminded me of Hairdo's textured fringed bob which I love. as well as your ones. We really planted to bring the wildlife in, and it certainly has done that. Bears sound a little scary LOL, our son was recently on a trip to Russia adventuring as he does, and sent this photo back to me! Glad to say he is home safe again now. A Kodiak? Amazing photo of a truly beautiful animal. Our son was fairly up close and personal to him, but he called him a grizzly bear "baby"! Absolutely gorgeous country he was exploring. 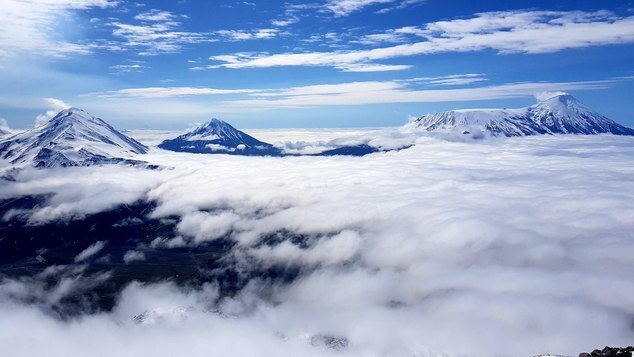 He summitted the volcanoes and mountains. How beautiful! He does look like a grizzly. Plenty of those around BC. They look really scary! Hope there are none near you. 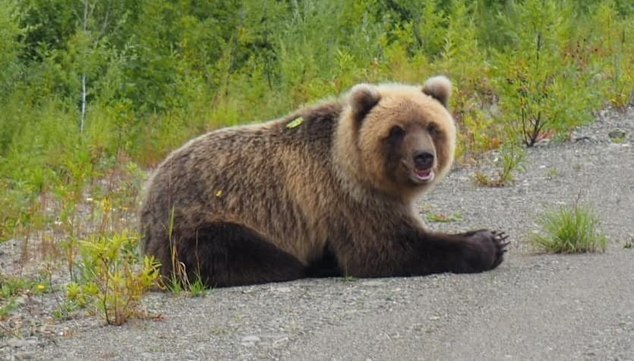 Just brown bear here (I hope). I see river otters in the sea outside, sometimes a whole group of them playing. Oh, how gorgeous, you have a very special part of the world to live in. I saw otters when we were in Milford Sound in New Zealand - beautiful creatures. We used to have platypus in our creek, but one year the drought was too bad, and they moved on to a larger dam/creek area. I would LOVE to see a platypus. They are very shy, I used to take my book down and folding chair, and sit and read, and after a little while they would peak at you, and then start playing! Very cute. How wonderful! One day I will visit Australia.